My disdain for the dentist continued on as I had to endure fluoride trays filled with sickeningly sweet “bubblegum” goop, a dentist who smelled of an odd and overpowering mix of Scope and cigarette smoke and the terrible sounds of drills and suctions. I still shudder at these memories. Orthodontics didn’t help the matter and when my wisdom teeth were pulled, I never went back to the dentist – for nearly ten years. When I finally did head back to a dental office, I was still filled with a lot of anxiety. I have definitely been better about going to the dentist, but I still go dragging my heels. I didn’t want Ninjette to have the same kind of experience. Despite the fact that our first real trip to the dentist was after she wiped out on her scooter and busted up her mouth pretty bad, we found an amazing pediatric dentist. 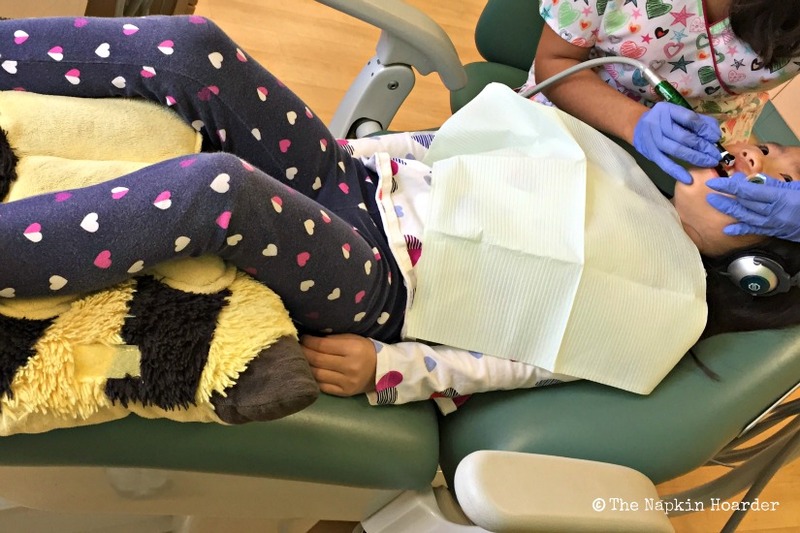 Having the best time at the dentist – pillow pets & Netflix on the ceiling! She loved the dentist. She loved going to the dentist. It was a fun trip for her without any anxiety. She actually asked for the dentist and wondered when she would get to go next. It was wonderful to see a dentist speak to my daughter in a way that was soothing and reassuring. We truly lucked out in finding a great dentist from the beginning. I truly appreciate those who have chosen to take the route of pediatric dentistry because they have a special gift. Having a kid who has had to endure a lot of poking and prodding at medical offices, I’m so grateful that we have been able to find various medical professionals that make us, especially Ninjette, feel comfortable. If I could go to a pediatric dentist, I don’t think I would hate the dentist so much. How about you? Do you have anxiety when you go to the dentist or doctor? I just went to the dentist a few weeks ago, and she had her new puppy hanging out in the office! I normally HATE going to the dentist too, but knowing a puppy was at my feet somehow made the experience a little bit better! I would be all over puppies at my dentist office!